Getting a straight answer from HPD on their position on noise enforcement is as difficult as cornering a Menehune in a pineapple field. Or harder. A Quieter O'ahu was able to find some actual facts and figures that were reported in the Star Bulletin under their Kokua Line on 16 March 2009. That posting isn't available to the general viewing public any longer, but if you have a Star-Advertiser account perhaps you can look it up under the title "HPD's war on noise is alive and well - Kokua Line." The important statistics, however, are posted here. And "Alive and Well"??? Well, let's take a look at the numbers and let our readers decide for themselves. Remember that the title of the accompanying article was: "HPDs War On Noise Is Alive And Well." But consider this. --The total citations issued over a five-year period is 4,048. --That's an average (4,048/5) or 810 citations per year. --HPD has approximately 2,000 sworn officers so that's an average (810/2000) of only 0.4 (four-tenths of a citation) issued by each officer for each of 5 years. --If we extrapolate that fraction over an officer's average 20-year career (0.4 x 20) we see that over an officer's 20-year career at this level of issuing citations they can be expected to issue only eight (8) noise citations per officer per 20-year career. "War On Noise" - Really? 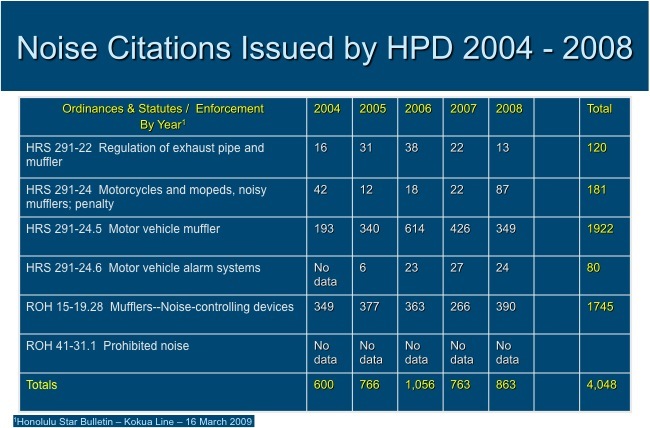 In light of this the Hawaii Kai Neighborhood Board in approximately 2010 asked that HPD District 7 provide a monthly report of noise citations issued for the Hawaii Kai neighborhood. HPD District 7 complied, but over the approximately 8 - 9 months that they provided these numbers they simply reinforced the above statistics that HPD ISN'T DOING ANYTHING to support noise abatement. Oh, and are they still reporting? No, they simply stopped after about 8 months with no explanation given. Now imagine a different possibility! --What if each of our 2,000 HPD officers were to issue JUST ONE (1) citation per month. --Over five (5) years that would come to: 2000 officers x 12 citations each per year = 24,000 citations per year x 5 years = 120,000 citations. --Or, better yet JUST ONE (1) CITATION PER WEEK: 2000 officers x 52 citations per year = 104,000 citations per year x 5 years = 520,000 citations. --Now THAT might warrant the title "War on Noise" !! EVERY Neighborhood Board should ask their HPD representative to provide statistics at each neighborhood board meeting on the number of noise and related citations issued within their district, correlated to specific noise statute or ordinance, for the previous month, and the aggregate for the year. We wager that little has changed since the above statistics were reported over 9 years ago.